The unique geological formation of Cyprus more than 100 million years ago gave rise to, in parts, a very dramatic coastline, however there are also some beautiful sandy beaches and picturesque coves waiting to be explored. The Blue Flag is an exclusive eco-label awarded to over 3200 beaches and marinas in 36 countries across Europe, South Africa, Morocco, New Zealand, Canada and the Caribbean. This accolade is awarded on the basis of environmental management criteria covering sewage treatment, coastal planning and protection, bathing water quality, safety and services and environmental education. 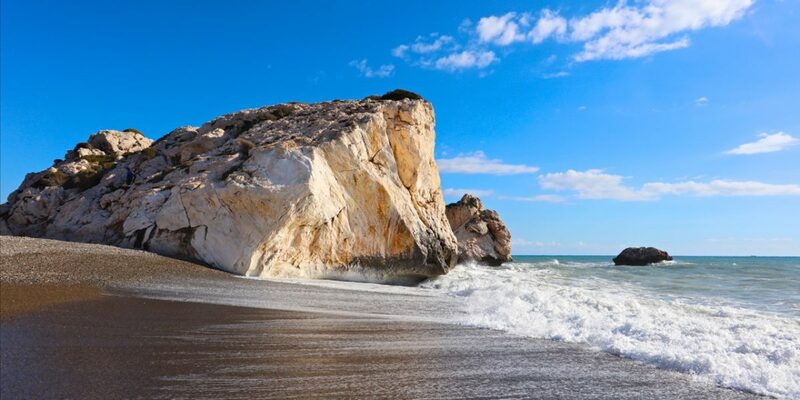 The small island of Cyprus has 57 Blue Flag Beaches for locals and tourists to enjoy. As well as the more well known sandy beaches on the island, for example Fig Tree Bay in the east and Coral Bay in the west, take some time to find the quieter and less accessible beaches where the sea is crystal clear and the sand soft between your toes. Look out for Lara Bay, the hidden treasure in the Akamas National Park. Lara Bay is so perfect, it is one of a number of beaches in Cyprus where Green and Loggerhead turtles come each year to lay their eggs. For the more adventurous, explore the caves and rock pools of the Sea Caves area, or one of the many tiny harbours dotted along the coast.